The chairman of the ruling Justice and Development Party (AK Party), President Recep Tayyip Erdoğan, announced the party's election manifesto in Ankara Thursday. The program was held in a festive environment, with candidates and members from 81 provinces in attendance. The 11-article manifesto brings a new vision to municipalities with an emphasis on smart, unique and eco-friendly cities. City Plans: Instead of being short-lived projects, city plans will be created with a focus on being fair and achieving long-term results. Infrastructure and Transportation: All infrastructure and transportation problems will be fixed in every city. Urban Renewal: Urban renewal plans will be drafted in line with the region's features and the people's needs. Smart Cities: Cities will make use of all means of technology to better serve people. Environmentally-Friendly Cities: Green, eco-friendly cities will be developed in harmony with nature. Social Municipalities: Municipalities will work on projects that pay importance to people's social needs. Low-Rise Urbanization: Cities will go horizontal instead of vertical, promoting values of family and neighborhood. Unique Cities: Cities will be developed in line with their histories and cultural heritage. Administration with People: Municipalities will take all administrative decision with the people. Efficient and Transparent: Municipalities will allocate resources both diligently and transparently to generate savings. Value-creating Cities: Cities will work toward achieving cultural and economic advances to improve people's quality of life. 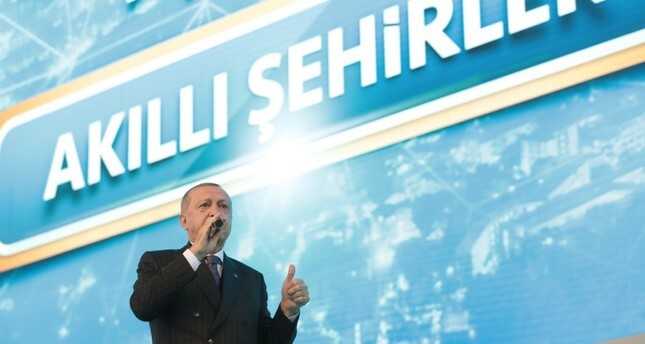 "The AK Party was established by the cadres who pioneered local governing and won the hearts of people with the services they provided," Erdoğan said speaking in the candidate presentation meeting at Ankara Sports Hall and stressed that the AK Party will uphold humility, sincerity and endeavors in the upcoming period. Following the announcement of its manifesto, the AK Party will start its official campaign process as of today. Erdoğan announced in the manifesto that the AK Party will prepare city plans that will be fair and cover long-term needs. While preparing the city plans, all public and private sectors and civil society representatives' opinions will be consulted and decisions will be made in a democratic way. No time or resource will be wasted on things that will not increase the quality of life for people. The process of preparing the city plans will be transparent and if a change is necessary for the city plan, it will be subject to the observation of the citizens. Since infrastructure and transportation are typically among the key services of the municipalities, Erdoğan highlighted, "Infrastructure and transportation problems in all cities will be completely eliminated." He added that "the AK Party will also observe the efforts in municipalities of other parties to overcome their shortcomings in infrastructure." With an aim of solving problems in transportation, the AK Party will accelerate public transportation projects and will prevent people from spending long hours in traffic. Furthermore, the issue of parking will be an essential priority in the city plans. Erdoğan highlighted that urban renewal will be in line with regional features and people's needs. The urban renewal projects' focal points will be preventing irregular urbanization and taking measures in cities against earthquake risks. Another significant objective in the AK Party manifesto was to enable the development of unique cities, which have their own stories reflected in their geography, people and history. "We will not allow any project that has no aesthetic value and that will not contribute to our cultural properties," Erdoğan said. In relation to the AK Party's eco-friendly election campaign, Erdoğan stressed the significance of environmentally friendly cities that are in harmony with nature. He underscored that the efforts to eliminate all the negative impacts on nature will be extended in all cities. Erdoğan also stated that the number of People's Gardens will be increased in all cities in order to provide people with places to relax and spend time with their families. Previously, the AK Party announced that it would conduct an eco-friendly campaign in line with the increasing demand from society to end the chaotic atmosphere during election periods. During election periods, it is common to see political parties decorate the streets with party flags and play campaign songs from minivans, which cause a great deal of visual and noise pollution. As part of the green campaign, the AK Party will only be allowed to display flags near party organizations and election coordination centers. AK Party election buses will not be touring, except during specific times set beforehand. Çiğdem Karaaslan, AK Party deputy chairwoman and president for environment, city and culture, told Daily Sabah yesterday that, "The AK Party has been taking a leading role and will conduct an eco-friendly and human-centered campaign." In the manifesto of the AK Party, it was also stressed that the party will support all efforts for smart cities with all technological means to serve citizens. Karaaslan highlighted that the 11-article manifesto reflects the AK Party's values and principles in the field of local governing. "As indicated in our manifesto, we are prioritizing cities that will create value, culture and art." She highlighted that with the vision first set by Erdoğan during the time when he was Istanbul mayor will be embraced by all mayors of the AK Party to reach the 2023 objectives. "We will extend our perspective of social municipalities to enable providing services to all families, children, young and old people, women and disabled people," Erdoğan said in the grand meeting, putting emphasis on the AK Party's priority of social municipalities in its election manifesto. He highlighted that even in the smallest districts there will be sports centers, woman and youth centers, art and culture centers and centers for the old and disabled. While establishing centers for all people living in the cities, the AK Party will ensure that no segment of society will be left behind or ignored. The party will also focus on efforts to make sports a part of people's lives. As the AK Party will support environmentally friendly cities, low rise urbanization will be at the center of its vision for the cities. Touching on the significance of low rise urbanization, Erdoğan said it will enable promoting family and neighborhood vitality. The low rise urbanization will also contribute to providing more green areas to people. Erdoğan stressed that this model will be prioritized in urban renewal projects. In the manifesto of the AK Party, the rights of the people living in the cities were particularly emphasized. Accordingly, Erdoğan said all the important decisions regarding the cities will be taken with people who live there. He underlined that "We will prepare a manifesto of 'city-dweller rights' for people to whom our municipalities provide services." He said significant projects that will directly affect the lives of people, will be definitely consulted. Erdoğan also said the efficient and transparent use of municipal funds with a saving scheme will be ensured. "We will meticulously evaluate the necessity, productivity, priority and quality of the source while making an investment and providing services, and then we will take our steps," Erdoğan stressed and added that the citizens will be able to access all the information about the process as well. In the upcoming period, the AK Party will focus on value-creating cities that will improve people's quality of life. Accordingly, Erdoğan highlighted that the needs and expectations of people living in the cities have been changing. "We can summarize that people's main expectation today is to increase their quality of life in all fields," and added that the AK Party has been working on this for a long time. Last year, the AK Party prepared "My City 2023," analyzing all aspects of 30 cities. Erdoğan said that as a result of this analysis, they drafted the weaknesses and strengths of the cities. In light of this project, in the upcoming period, the cities will be governed with the perspective of value-creating cities. Touching on the People's Alliance formed with the Nationalist Movement Party (MHP), Erdoğan stressed that the AK Party is strongly committed to the alliance. "In this process, we will not give ground on our commitment to the People's Alliance, which we see as the guarantee of our national security and the future of our nation," Erdoğan said. The People's Alliance between the MHP and the AK Party was formed ahead of the June 24 parliamentary and presidential elections. The alliance received a majority in Parliament, while their presidential candidate, Erdoğan, won the election by 52.6 percent of the vote. As both parties consider the results of the June 24 elections successful, they now seek to continue their alliance in the local elections. AK Party Deputy Chairman Hamza Dağ told Daily Sabah during the grand meeting that, "As the AK Party, this is our fourth local election, considering our party chairman and organizations we can easily say that we have significant experience." He added that thanks to its experience, the AK Party has been the following firm policies in municipalities. "There will be a difference in these local elections. We will participate in elections with the People's Alliance formed with the MHP and together, we aim at success in the local elections," Dağ stressed.